Just over a month ago we highlighted the consultation for the transport corridors supporting the major greenfield development areas in Warkworth and around Dairy Flat. It built on work done by Auckland Transport a few years ago and was the first public part of a process that will see major transport corridors designated well in advance of any development. Now the project alliance undertaking the work is consulting on their plans for the growth planned for South Auckland where they say projected level of growth has increased by 30%, even compared to 2016. That means the transport system will need more capacity. 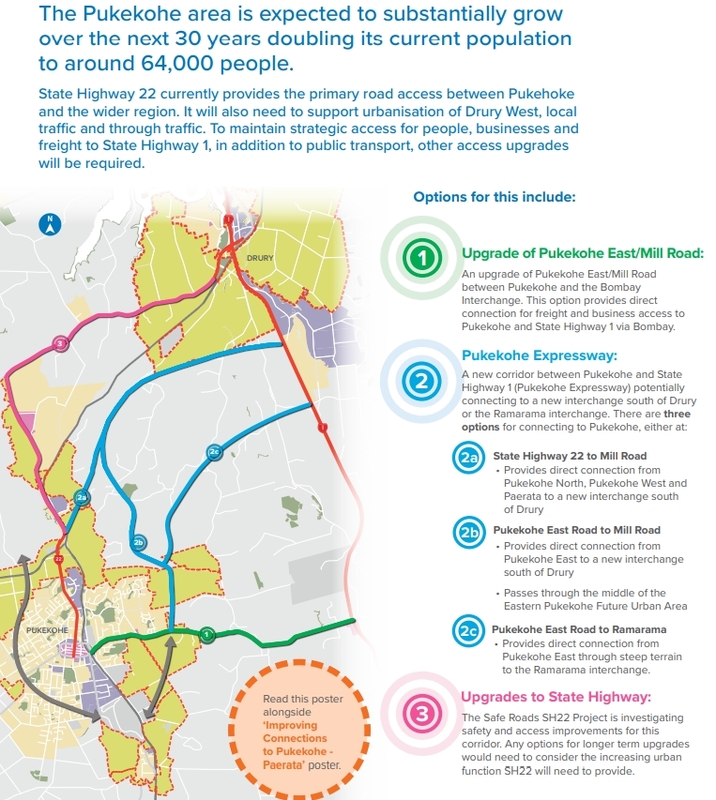 For the rail network, this means potentially four tracks will be needed all the way to Pukekohe, for the motorway it means the Southern Motorway the current widening will need to extend at least to Drury. But perhaps the most interesting aspect of the consultation is the suggestion of building another rapid transit line in the south, largely parallel to the existing Southern Line. This proposal has me conflicted. I want to see a lot more public transport infrastructure In Auckland but delivering a rapid transit level quality network of almost full grade separation is difficult and expensive. The project team told me that this is due to their modelling showing even 9-car trains running frequent services would be mostly full by the time they reached Papakura. This seems implausible and would require significant property purchase. It seems to me that even just a frequent bus route/s with appropriate priority might be a better option than a full busway to address the problem. At the moment, with the exception of the 33 which runs down Gt South Rd, none of the local buses are even at a frequent status. In addition to a whole new RTN route, they have suggested there will be bus lanes on the motorway too – which would require an additional lane on the motorway they’re just in the process of widening. It’s not clear who would be using these motorway services if there’s already a parallel rail network and even more so if there was also another parallel rapid transit route. As part of ATAP, it was agreed that Mill Rd would go ahead but in a different fashion to previous plans. Just what that looks like is currently being evaluated. The project team are also starting to look at the options for how it connects at the southern end as well as some new connection options to the North. As you can see, three of those options end at the same spot on the motorway and they would feed into…. A new expressway is proposed which would start at the point that Mill Rd ended. That expressway as well as the existing road connections would link to potentially one or more ring roads. There are four level crossings in Takanini and they’re some of the most dangerous. The plan is to grade separate two of the level crossings and close the other two. The big project in the area is to create a new crosstown connection with (likely a bridge) that connects Rangi Rd to Mahia Rd. To do that it would need to span the motorway, the creek and the rail line, which means it’s likely to be nearly 500m long and that won’t come cheap. Finally there’s Drury, both east and west of the motorway. There are definitely some big roads being planned out south but also some significant PT improvements too. Consultation is open till next Wednesday, October 10. Yikes so many new/upgraded roads just to feed into a congested motorway… not much thought put into it…. The thought has improved since the last plans, with the addition of PT and active modes. But it hasn’t been able to shake the roads first bias yet. No growth should be accommodated by extra road capacity at all. All growth should be accommodated with PT and active modes. This means Mill Rd should be a rapid transit and cycle corridor, of course. And it should not be a corridor for private cars. It also means the motorway widening must stop. At local levels, there needs to be high cycling and walking and PT permeability, but the private car network must be kept local, slow, and feeding a few existing arterials and motorways, but with no parallel road network. +1 Yes, for example, Mill Rd should have 1 general traffic lane in each direction generally with at least transit lanes from day one. I agree. And that one traffic lane in each direction needs to have a couple of blocks at well-chosen points to ensure that the route cannot become an arterial for private cars. PT improvements should be made first, followed by a reassessment of what road expansion is actually necessary. By all means designate the corridors to protect them but don’t start increasing road capacity until the (cheaper, more environmentally friendly, more spatially efficient) alternatives are in place. Manukau Brown ? It’s got a certain ring to it. There was originally a plan to construct the station under or near the mall site, which would have been a much better location, in my view. However, it was not proceeded with on cost grounds. It’s only a matter of time before the centre of gravity of Manukau moves towards the existing Manukau Station. Lots of vacant land yet to be developed between in and the motorway. 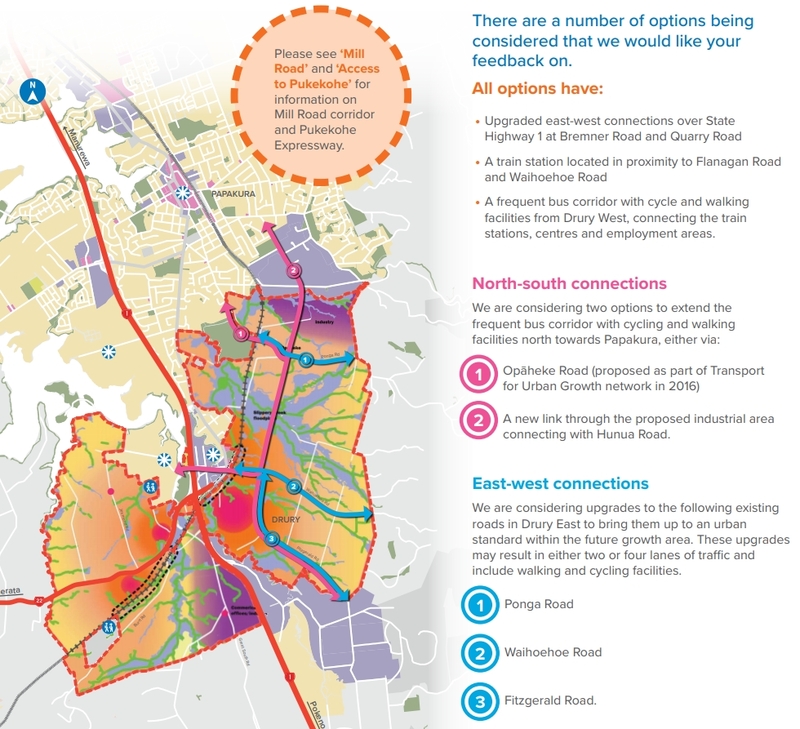 Any new road construction consents, Mill Rd etc should come with a mandatory requirement to build separated cycle ways as per Papakura to Takanini interchange and the Nortwestern cycleway. No more retrofitting! Better would be a mandatory requirement to provide a separated cycleway away from the motorway. Motorway fumes are not ideal. 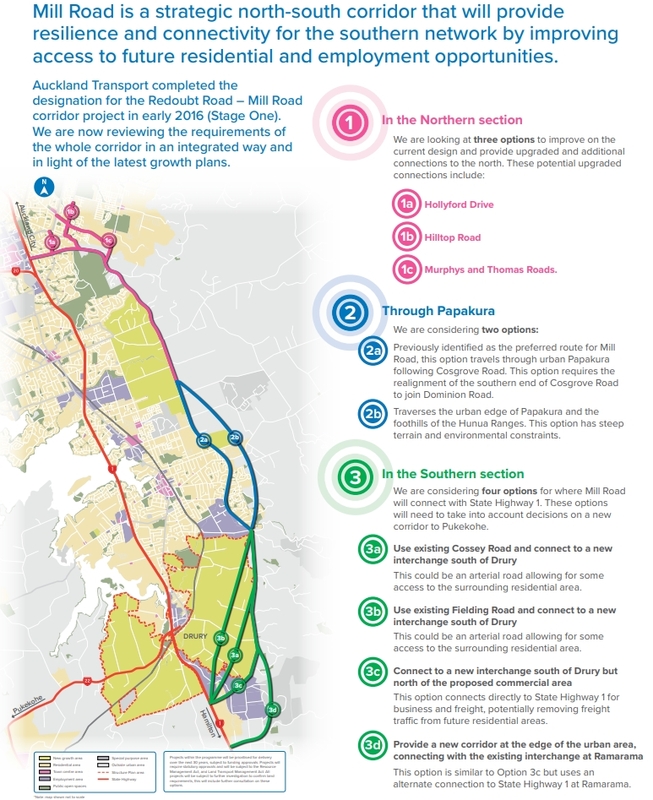 The good news is that some NZTA thinking is appearing with this planning in that it is recognised that PT demand is growing south of the Auckland Council border at a rapid rate as well. Auckland Council and AT thinking stops at the southern city limit. That thinking is recognising the increased residential growth from the Waikato, Tuakau, Pokeno and Te Kauwhata are rapidly becoming dormitory towns of Auckland and should be part of the public transport network. Some thought needs to go into not only electrifying the main trunk to Pukekohe but extending the project to Hamilton. That would eventually enable an all electric passenger rail service from Auckland to Palmerston North. Get on with it Kiwirail and NZTA. The motorway junctions at Papakura and Drury will soon come under increased pressure from new housing subdivisions already underway at Clarks Beach, Waiau Pa, Karaka, Patumahoe and Glenbrook Beach. There are no jobs out there, they have to come into the city to work and road transport is the only way at present. The above do not feature in the above maps. The focus to date is only Pukekohe, Paerata and Drury. A second Manukau Harbour crossing from Te Hihi to Weymouth would help south bound traffic to the airport. The south presents some challenges but unless planning is started now, the land will be locked out of reach to future generations by private developers who are flat out buying farms. I wonder also whether a service to connect Waiuku to the RTN, perhaps with battery-powered trains running from there to Pukekohe or Paerata, could also be a viable longer-term transport solution for the region. 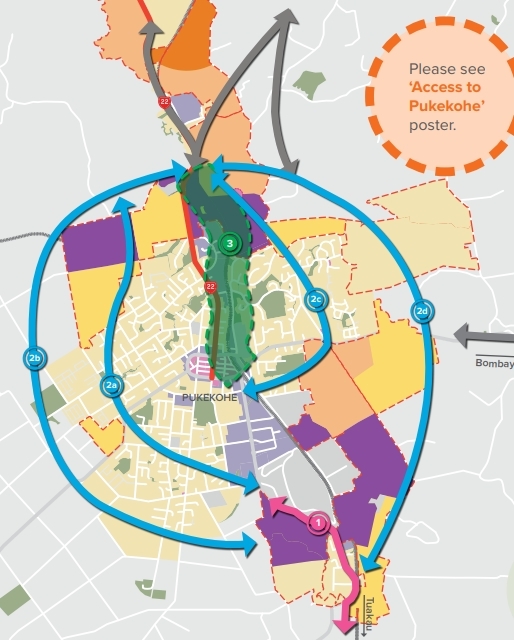 A link from Te Hihi to Weymouth could also connect into a postulated RTN line through Clendon Park to Manukau shown in the above maps. I think they should upgrade and electrify the train line to Waiuku, in combination with zoning new villages at Patumahoe, Mauku and maybe a third location. Then the southern line could run full frequency to Paerata and split into two branches, with half the trains servicing Pukekohe (and Buckland and Tuakau, ideally), while the other half serve the new Waiuku branch stations. So each branch getting a train every twenty minutes. This could be paired with the CFN concept where the southern line regularly expresses past suburban stations in south auckland that are otherwise serviced by another line. Together this would amount to something close to an RER type model, of commuter towns and villages focussed on relatively high frequency rail services that express through the suburbs and city stopping only at major interchanges and destinations. Some good points there, Don. But Auckland already covers enough land. What future generations need is the current land to be opened up to intensification properly. What they don’t need is that greenfields land opened up. It needs to be left undeveloped to provide (in an increasingly better managed way) for our green infrastructure needs. Yes you are absolutely right Heidi that Auckland does cover enough land. I wonder how much enthusiasm there would be for sections in Clarks Beach and other far flung areas if residents had to pay the true cost of petrol (including carbon costs) and the external costs of driving that the general tax payer currently picks up. Unfortunately also every dollar spent on roads is a dollar not spent on more worthwhile areas such as housing, health and education. I am concerned when I see that the reaction of some people to petrol price increases is that they believe they will cause petrol to become cheaper by protesting. Instead part of the answer lies in people making better economic decisions to react to the new norm. That may well be living in more compact environments as Heidi suggests. The new norm will include less use of fossil fueled vehicles as the government is not going to compensate people to drive the same amount that they do now; that won’t address carbon emission reductions. They seem to be claiming that the rail network lacks adequate capacity to serve Drury, but then instead proposing rapid transit lines which just connect Drury to other train stations anyway. And south of Drury, instead of using bus lanes on the motorway, would it not be better to construct a 12km branch line from Mill Road at Bombay to Drury? The RRR proposal costed this at $120 million for a high speed alignment, although that cost did not include stations. They seem to have an allergy to building new rail lines, must be a hangover from the bad old days of roads only. Very interesting study. I agree that a new RTN route would be expensive, but surely that’s really the kind of bold vision that we need for PT in the south? 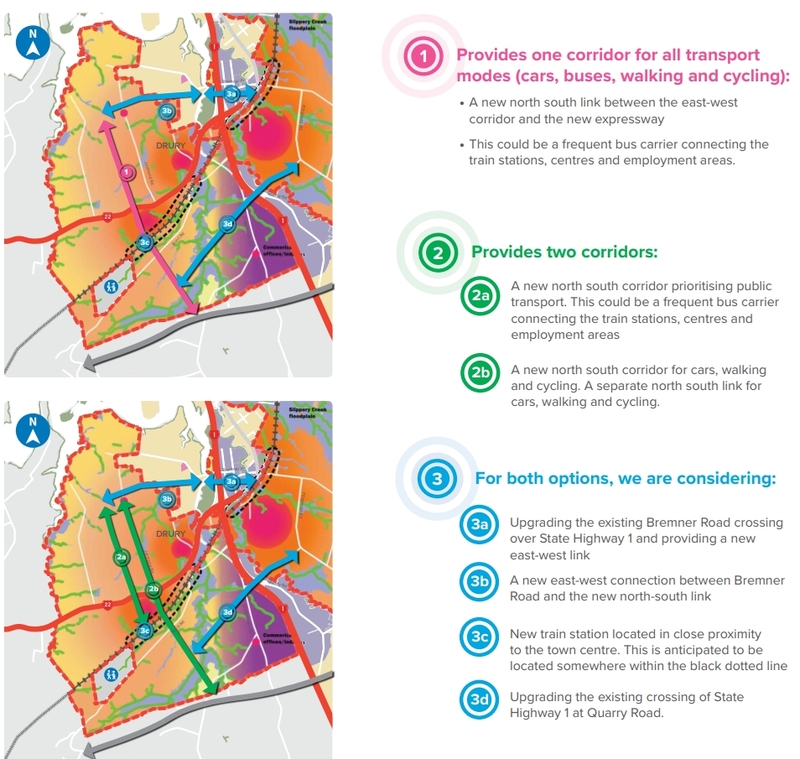 To create a more open “network”, then I’d favour the “eastern” option, which could also link into the Botany-Manukau busway, potentially providing an easy link from that corridor to the deep south. 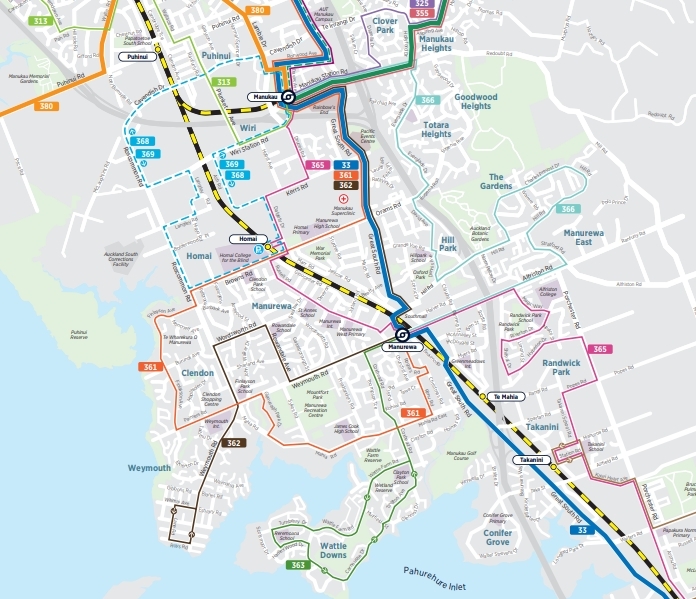 You could imagine (for example) a busway from the Southern Line at Drury, with stops at Redhill, Alfriston, Totara Park, Clover Park (connecting at Clover Park with the Airport-Botany RTN), Manukau CC, and then connecting to the Eastern Line at Manukau Station. Having said that, there is merit also in a western approach through Clendon but I suspect the eastern route would be more beneficial to the wider network. 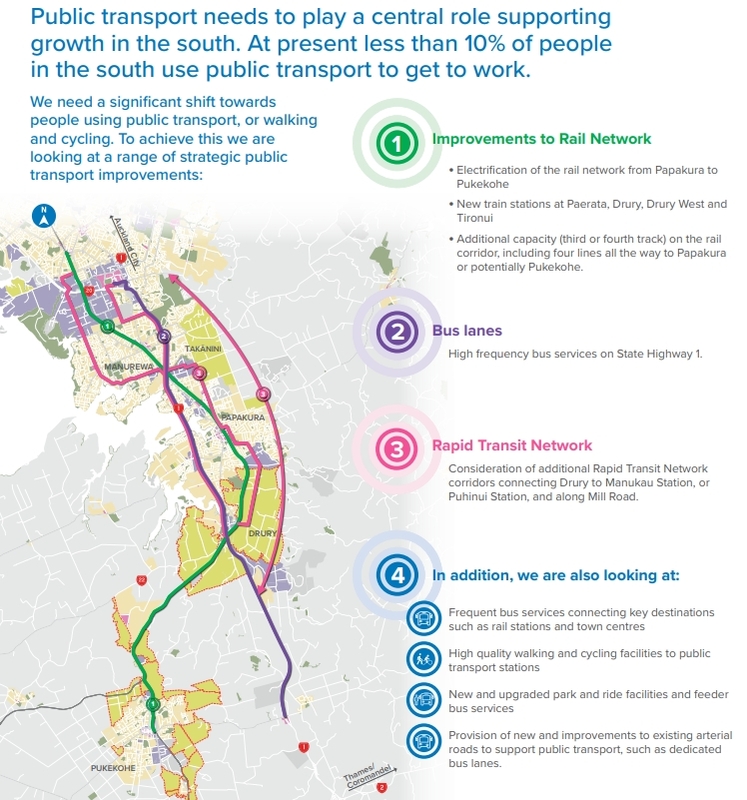 Either way, I think we need to talk up new RTN possibilities, as the comprehensiveness and connectivity of the RTN will be the making or breaking of Auckland’s transport network of the future. The rail and motorway are not always close by. In some place there is a 1km distance between them. People living on the other side of the rail may find the train station too far to connect, and would prefer to drive instead, so it adds traffic on the motorway. Some NEX style bus using the Motoway would provide extra catchment and capacity for people live near the motoway interchange. Ideally the have busway should have interchange that connects to where train station joining motoway like Te Mahia and Drury. Another advantage is it can also serve the central south. For example to serve the area near Clover Park, Otara and East Otahuhu, the busway could run all the way north until Remuera/Greenlane to transfer to rail. I am looking forward how they implement the walking and cycling connection the the stations. To encourage people walk and cycle, the connection should be safe and peaceful. The last thing we want is put some green paint in the middle of a heavy arterial road no safety barrier (Like Porchester Road). It is unsafe to cycle along polluting trucks and cars who ignores the cycle way. I would prefer the connection located along the parks and local roads. Yes, and instead of saying that they are “looking at options” for providing cycling and walking connections on the level crossing roads that are being closed, this needs to be a requirement. High permeability is a key concept that needs to commitment early on or will be fought on the basis of cost later. Since road has not yet laid, I believe now is the perfect time to design for good pedestrian/cyclist permeability street network. We would like to have a walking/cycling network inside subdivisions to connect cue-de-sec, parks, streams, walking tracks to public transport node and local shops. The last thing we want is force people to walk the main arterial road. Flip, it does look to be getting busy down there. The Southern line is very busy in peak already, so I could easily imagine even with 9 car sets this blowing out. A near busway like standard or actual busway corridor on Great Sth Rd you think would do it considering all the other upgrades. Put corridors where they need to be instead of all these go around roads we have always done & do some road reallocation. Mill Rd needs some transit lanes from the start or we will just feed the traffic monster. I’m not sure I understand why? I mean London’s Piccadilly line moves 210 million people a year with 6 cars. Isn’t this 10x what our entire Auckland rail network currently moves? Surely we aren’t expecting that kind of growth are we? You would think this would go a long way in helping alongside of other upgrades to bus lanes, bus feeder networks & active modes. Not to mention Mangere to City & Botany RTN. Wonderful stuff, but when is the plan to actually increase patronage? I thought the CRL limit of 24-28tph was one reason we could not have HR to the airport. Does 48tph mean we could easily slot in HR expresses on all lines as well as regular airport HR services? That’s 24-28 per direction, which is 48-56 total. This still only allows 12tph to Papakura, Manukau, Swanson, and wherever we end the Western line (Probably Onehunga and Otahuhu. To service the airport, we still need to rob one of those destinations and spend a fortune grade separating several junctions. If heavy rail had been build from Onehunga as originally planned, the other end of the Western Line would have been the airport. This would have made for a simple and efficient operating pattern, however running expresses to the airport would have been pretty much impossible, meaning that it was never going to be much faster than light rail. These people now who are campaigning for heavy rail from Puhinui, seem to be completely separated from reality. I don’t think that there is any way to run trains to the airport via Puhinui that does not waste a significant amount of the rail networks capacity, unlike Onehunga which at least would have been efficient. 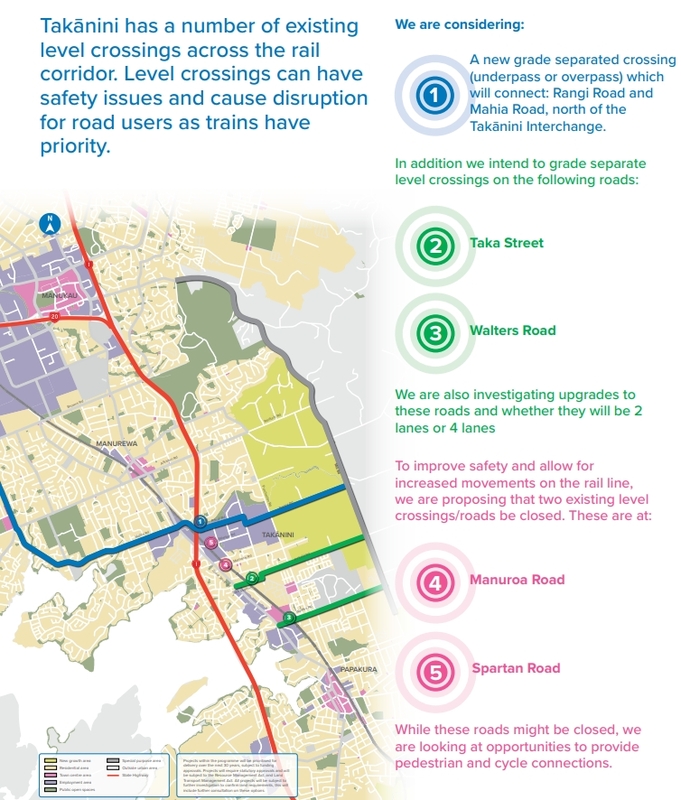 On another note, I will be interesting to see how popular the Onehunga line remains once the light rail opens, will it really be worth keeping the branch line open, with only 2 or 3tph when there are 6-12tph of light rail service to the city? Sam W, you’re looking at it as though everyone wants to travel between the CBD and the airport. Within a decade or two, we’ll have Auckland-Hamilton rail, possibly extended to Tauranga. Do you not see that there would be a demand for services between the airport and the south? Why should those in the south be forced to travel all the way into the CBD to get to and from the airport. For that reason alone, the Mt Roskill-Dominion Rd-airport light rail system doesn’t make any sense at all. Neil, I acknowledge that I am looking at this from a CBD centrist point of view, but this is for good reason: the CBD is the densest part of the city, making it the most effective for rapid transit and the least effective for private cars. The city makes a strong anchor for any rapid transit line. In regards to regional rail, I have given some though to how this could link into the airport and came to the following conclusion. The city is still likely to be a more popular destination for Regional Rail than the airport, and therefore a detour to the airport via a Puhinui branch line would add at least 8-10 minutes to the trip from Hamilton to Auckland CBD. Is it worth adding 8 minutes to a trip which will already be struggling to compete with travel times on the expressway outside of peak hours? Who’s talking about a detour? I’m talking about dedicated airport-Puhinui-Hamilton services, or, if there aren’t enough time slots or not enough demand, an airport-Puhinui shuttle. There won’t be enough demand, we will be running the shuttle, it should be buses tomorrow and LRT within a decade. no need to waste money on a heavy rail link. These long term plans are all well and good but there are urgent small scale projects that are needed now. For instance there is only one footpath between Takanini and Manuwera. The east side of the GSR through the Takanini interchange. An unpleasant and scary walk. Popes Road, where a pedestrian was killed recently, is part of a 1 kilometer link between residential Manuwera and Takanini industrial areas has deep ditches and no shoulders. All of these need footpaths and cycling lanes in what should be a flat cycling paradise. This is a very fast growing area but the transport infrastructure is lagging behind. Talk about cranes in the CBD count the diggers in Takanini. There is now a new primary school on the corner of Walters and Consgrave Roads which is inaccessible on foot. Urge readers to acquaint themselves with this area and make the appropriate submissions. +1 What level of confidence should we have that the new infrastructure will have walking and cycling provision when they’ve left what’s there so substandard? Fact is, if they go ahead with all this road building, the traffic it will induce on local roads – and let’s not forget that new trips induced by road capacity expansion is not included in their modelling – will make the existing substandard network even more dangerous. Try to shift mode share to active modes under these conditions, and they’ll be increasing the DSI. As soon as people step out of the walled community of the new Takanini developments, it become a truck wasteland that no one wants to walk. As the population witth in the Takanin developments grows, there is a urgent need to provide a high quality walking cycling connection to the train stations and schools. A quick green paint in the middle of the road is not high quality. Great South Road from Manurewa to takanini and down to papakura is a ridiculous mess. Chopping and changing from 2 lanes to 1 at traffic lights, parking lanes, and cycle lanes, creating a very tense traffic environment with constant aggression at lane merging. The area is also rapidly transforming from a rural industrial mix to include dense residential and commercial property with the ageing public transport facilities no longer suitably placed to actively encourage use. (in looking at you Te Mahia & Takanini stations, among the poorest performing on the rail network). Te Mahia: Am I right in thinking that AT needs to move bus stops on GNR to be beside the alleyway to the station? And a pedestrian crossing there, with whatever supporting infrastructure necessary to make it safe? As it is, the closest crossing is 190m to the south, or 1.3 km to the north… We know that’s substandard, unsafe, and affecting mode share. Basic stuff. How much money is being put into the growth-related road expansion projects, again, that are going to induce more traffic along this road? How much to put in a pedestrian crossing? How much do road construction companies make from putting in a pedestrian crossing? Perhaps these will be moved and a crossing added when the station has finished been upgraded? Same with Takanini, south bound bus stop is was up the road from the other one. Perhaps they will, or like Mt Albert, perhaps the poor location will be cemented by a new design that doesn’t bring them closer and may even take them further away. The link you gave is interesting. For some stations they seem to exercise the right to take parking in the closest locations only for the case of temporary bus stops, instead of allowing them to be used daily for good transfers. I see some extraordinarily bad things in this document for my neighbourhood and potentially my house in particular. This is now a matter of grave concern. Previously vague and distant possibilities seem to have crystallized as a choice between bad and worse. With so much traffic on SH1 in spite of the train network, I suspect there is demand for a rapid bus service down SH1. This could run on a T3 lane rather than a pure bus lane if there was concern that it would take too much space from cars. There is space for an extra bus lane right down from Drury interchange on each side. There would be the need for some extra construction over the railway at Manurewa but this could be combined with the bus station project for minimal extra cost. For the burgeoning suburban projects right through Karaka, the train station starts to feel like it’s all the way across town so there would be demand there. With a RTN at Manurewa, AT could finally close Te Mahia station and thus speed up the rail network. Additional service at Manurewa East would have a large catchment of people who’d find the bus service more convenient than the train. From there, some buses could connect to Manukau Station while others could continue on an express service to Auckland via uncongested bus lanes or T3 lanes as appropriate. The proposal could take a lot of cars off the road! No, what is needed is connections to the train network to be prioritised, ie east west frequent or Rapid bus routes with full bus lanes and optimised transfers to rail stations, all day Rapid frequencies on rail and longer spans. Not parallel Rapid Transit lines or, worse, parallel motorways. However, a parallel rapid transit line should always be considered before any parallel motorways or any increase in parallel road capacity. Indeed, it should be considered as a way to enable the blocking of existing roads used inappropriately as arterials, in order to create a local Healthy Street network.